Thus Calvin Seerveld, Canadian art critic and philosopher, describes the work of Zak Benjamin. Benjamin's art is filled with religious motifs some obvious, some hidden. In various works the person of Christ is prominent - upon occasion in the context of a Gospel story, and at other times, as here, in a contemporary setting. For nearly twenty centuries the Christ has captured the imagination of artists. Again and again he has been portrayed in one art form or another. One could say that these portrayals are attempts (albeit not conscious ones) to answer the question Jesus Himself asked: "Who do people say I am?" Who Jesus is to you can be stated or confessed in a variety of ways. The artist answers the "question" by means of his medium and in his own idiom. When we regard the person of Christ through the artist's eyes, our own understanding of who He is is unavoidably influenced. The thousands of portrayals of Jesus that exist are enormously diverse, partly because no contemporary depicted him, as far as we know. Each painting or sculpture carries the stamp of the time in which it was made. Every century laid its accent elsewhere. The art works of a specific era usually reflect something of the attitudes to life prevalent at that particular time. The prevalent view of Man and the nature of the Christian faith (as it was then understood and experienced) also play a part in the way Jesus is shown at different times. Thus our image of Christ becomes, in a certain sense, a picture of our self. In this way He becomes the one through whom one may discover, over and over again, one's own "human-ness". It is typical of twentieth century art to place the Christ figure in a contemporary, twentieth century setting. It is done consciously, to fulfill a particular purpose. Consider The Christ of the Breadlines (c. 1950), by German painter Fritz Eichenberg. Here it becomes clear that the Christ is concerned with the needy with the poor, the outcasts of our day, people standing in line for a morsel of bread. 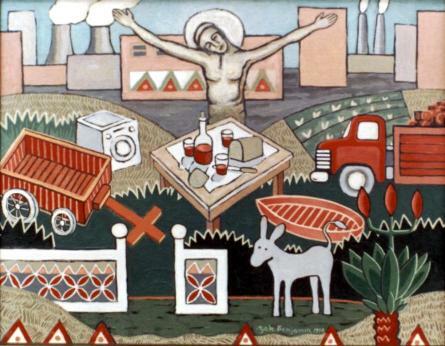 It is therefore not strange for us to see Zak Benjamin placing the Christ figure and the table with the bread and wine in the middle of an environment that strongly reflects the time in which we live. Here Jesus is not only the person who died on a cross outside Jerusalem two thousand years ago, but also someone who is involved in our day, our time, our daily existence. What is remarkable, is that Benjamin handles it so playfully, with such a light touch. Paintings portraying Jesus seldom make one laugh. When the Christ figure appears in a painting, whatever our modern ideas about art and church may be, we feel that we have before us a "pious" subject that ought to address us seriously. Zak Benjamin's work is different. It is almost impossible to look at it without having to smile. Perhaps because it is almost a caricature of our daily life. The painting is a little like a puzzle, and this can evoke a playful feeling. The various pieces are so wonderfully simple. Jesus is Jesus, the washing machine is a washing machine and the donkey is a donkey! The empty wagon and the full truck are two of the more ambiguous symbols placed in contrast to one another. Although there is no doubt that the painting addresses some serious issues, they are lightly and gently spoken in such a friendly manner. There is no hard sell here. The viewer is invited to interpret the work for himself, and his interpretation will most likely grow and change with time. The painting may be experienced on a personal level, but it may also be read as commentary on broader issues. The painter succeeds admirably in "handing over" to the viewer. Often artists' symbols are very personal, requiring a fair amount of pre-knowledge about the artist before one can begin to interpret the work. But Benjamin's almost iconically simple elements invite the viewer in. The innocence inherent in Zak Benjamin's style leaves one somewhat defenceless. There is little detail, but much essence. The complementary red and green ought to have an electric effect, yet there is a muffled milkiness to the painting that softens it and gives it an ordered rightness. Even though all the action lies virtually on the same plane, and everything is very much "in your face", the whole creates the impression of an orderly unity, cleverly constructed. It attracts you. The elements each function within the composition. Yet, in the end, it is the central theme of Jesus' invitation with which the artist works. One does not have to try to read too many meanings into the smaller motifs, even though each one could be individually, playfully and subjectively, interpreted. It is meaningful that the Christ figure stands so centrally in this work, as if the painter is suggesting that Jesus is the heart of reality. The focal point of the given is Jesus who is crucified, but who also stands, welcoming, at the bread and the wine. Although he is in the crucified attitude (note the traditional position of the head), He is no longer on the cross. Something of the resurrection is visible. And the body language with outstretched arms is welcoming. It is almost obvious that the viewer will experience that stance as an invitation, as if Christ says: "Come - in the midst of your busy life, work or play stop a while, come eat a little bread, drink a little wine with Me." Even though there is a hedge between the viewer and the table, there is also a little gate that stands open, underlining the invitation. In this work, Jesus finds himself in the world of our-everyday-reality, playfully portrayed. Benjamin paints the things we know from the work we do every day, but we can read these objects as toys, too. The context is both pastoral and industrial, a characteristic of our environment. Jesus is placed as belonging to this full setting. The symbols and colour suggest an African context, bringing the work even closer to the South African viewer. When looking at this painting by Zak Benjamin, one becomes aware of being questioned. The question that begs the viewer's attention: "What shall I do with this gentle invitation?" "...bright gaiety and humour combined with an ethereal seriousness ... the paintings hold together, as natural, the most outlandish realities. Bold naiveté of forms and colours, stories of mysteries and conflict, trouble and healing - with a difference: friendly, zany, readable, provoking the viewer to look again, a wholesome pleasure in the grit of life..."